I got this bag from my little sister and stepfather, I can’t seem to ind the brand. I’ve owned it for about 8-9 years and I still love it. The eyes are speakers, but unfortunately they stopped working after a year. I try to keep the content organized, but it can look messy. And you won’t find trash or other things that shouldn’t be in there, because I try to keep my bags clean and I switch between bags frequently. The little doll on my bag was also a gift from my little sister. I used my bag when I visited one of my sisters in law. 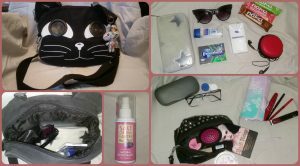 So there is my wallet, sunglasses, chewing gum, a disinfect handgel, tissue paper, earbuds and the container I keep them in, some Nàkd bars, deodorant, my glasses, the case for my glasses, lens holder and the make-up that I wore that day. Mascara and concealer from Catrice, eyeliner and facepowder from essence, lipliner from Hema, Dark Reign eyeshadow palette form Makeup Revolution and Armageddon liquid lipstick from Black Moon Cosmetics.